Discussion in 'Official News and Announcements' started by PS2_Luke, Aug 19, 2015. What? No! An ADVANCED NANITE TRANSPORT's job is to collect nanites, and transport them to bases to keep them running. Running bases out of power was an important strategy in PS1, and in this game at those Crown/BioLab/SNA/Xroads slobberknockers it will be a key strategy. PS1 literally laid this system out for you. Why mettle with a good thing?? “What? No! An ADVANCED NANITE TRANSPORT's job is to collect nanites, and transport them to bases to keep them running. Running bases out of power was an important strategy in PS1, and in this game at those Crown/BioLab/SNA/Xroads slobberknockers it will be a key strategy. How do you know the ANT isn't still going to be a Nanite transport to bases aswell? Thank you for post and work you've done. The ANT and construction sounds like a good start but I have do see a possible issue. Players want meaning to the things we can do, the vehicles and bases and not just have cool things to do. This was the purpose of the resource/territory revamp, to give more meaning to our actions besides killing and more strategy. What will be the purpose of creating a tower? What advantages will that give my empire over the other? I can imagine it being a kind of FOB or in between bases and while that is cool, in between bases fights have minimal purpose besides holding off armor/zergs. There'll need to be a change in the flow of battle that incentives fights outside bases. Like fighting over the new resources except if resources are only for constructing towers (at first) that's not a good reason. The same for the WIP Colossus tank. A dev months ago on a stream was asked about it and said that it will need a purpose before being implemented. Maybe the slow, but stronger tank will be needed to destroy a tower or other heavily fortified structures. And the colossus can only be pulled having a specific base or resource. There's more purpose to the tank, construction and resources yet I believe territory/resources need to be the interwoven foundation of purpose we fight over before we give purpose to all these other features. That's all players want, to be give reason to the number 1 object we fight over to allow more strategy and build upon it across the other areas of the game. If you read this, thanks and reply if you can. Well if i had to make a educated guess about the ANT, maybe it gathers the resources then driven to a spot and maybe Deconstructs to build one of these Towers? I can say it seems pretty cool for me, I'm looking forward to see this in the game! This is not currently part of the plan and also not everyone is looking for the PlanetSide 1 experience. As he stated, we need to add tools to help drive player experience and we believe this is the way to start that. What happens in the future, anything is possible but this is what is happening immediately. ANNOYING me the new players; if they need 100 tutorial to understand planetside, go away! Sorry developer, but resource revamp was in "roadmap" of may or june 2013!!!! “ANNOYING me the new players; if they need 100 tutorial to understand planetside, go away! As I stated back in February, the old Roadmap is gone so I hope that clears that up. Everything on it came off the table and what you see here is the only plan going forward right now. If you don’t know me, I'm Luke Sigmund, Lead Designer of PlanetSide 2. We’ve seen how excited some of you are for more information about upcoming content and we’re just as excited to share it. We wanted to take some time and fill you in on where the team is taking the game and give a little insight into the future. As a team, we've spent the last couple weeks discussing and determining the direction of the game moving forward and adjusting our 2015 Roadmap. We started by examining what the game is now and where we and you all would like it to go. Through the process of several team meetings, we came to the conclusion that we want to put tools in your hands to create gameplay experiences that have a variety of strategies and moment-to-moment tactics. Letting players affect gameplay is a huge component of PlanetSide 2 and we intend to double down on that moving forward. Our biggest step will be the introduction of a player placed construction system. Using a new vehicle, the ANT, you will be able to hunt down and collect a new resource out in the world. After you collect enough you can travel to an area of your choice, deploy your ANT, then interact with its terminal to deduct the new resource and place a structure. Our first set of structures are planned to be medium sized base turret towers, with more to come as we start gathering suggestions from you and playing with the system. This is just an overview, and we have a lot more details that will be posted in the roadmap section of the forums really soon. Throughout the rest of the year you will also start seeing adjustments, improvements, and additions to current mechanics and features, kind of like we've been doing for instant action and spawning rules. We will mainly be targeting features that we are eager to make better like continent capture, leadership tools, and implants. With the overall goal of making these systems fit in with the direction of giving you tools to play how you want. Like I said, this update is just to give you all an idea of where we are headed. This is a journey for all of us so we are all excited about the plan and hope you are too. We look forward to all of your feedback and thoughts on upcoming systems and appreciate all of your passion and support for PlanetSide 2. Please realize that PS1 got it right in the first place (pre BFR/Caves) and build upon THAT system instead of doing the same mistakes Higby and co. did by trying to create a completely "new" game that is riddled with balance issues. Sphere of Influence, NTU-silos, etc, give! So the lower pop faction (s) isn't totally out harvested and out built by the higher pop .. The lower pop factions would then gain a greater yield per node than the higher ones, to hopefully stop the run away snowball effect higher ( over ) pops can have .. Sorry for the feedback RadarX, im your fan. But why dont make a "donation" for a roadmap big update? I will spend 200$ or more if you make a serious update like resource revamp and "new capture system"
So what exactly are you guys planning in terms of base constructables? I understand turrets and shields are very big plausibilities, but could you elaborate somewhat on your plans? “This is not currently part of the plan and also not everyone is looking for the PlanetSide 1 experience. As he stated, we need to add tools to help drive player experience and we believe this is the way to start that. This isn't about not everyone looking for the PS1 experience (I know I'm not, I never even played the game), this is about opening the market to people who want a different experience within the game. Not that there's anything wrong with focusing on the core core experience of directly killing mans, of course. Regardless, it would be cool if, at some point, there were some viable support role playstyle that doesn't require being on the front lines all the time, or bots, to help indirectly kill more mans. That's what RR and ANTs meant to many people. Convoys, small squad strategy, mechanization and mobility, etc... Edit: It'd help fill the gap the lattice supposedly left us without, too, without impinging on the experience of the latticegoers, hopefully. Of course Lattice is 10x better than hex, but there were a group of people who liked that sort of thing. “This isn't about not everyone looking for the PS1 experience (I know I'm not, I never even played the game), this is about opening the market to people who want a different experience within the game. Not that there's anything wrong with focusing on the core core experience of directly killing mans, of course. And that is exactly what this is about! We aren't trying to bring a PS1 experience, we are trying to give you guys the tools to create gameplay experiences through strategy. Huh! Well, the method isn't what most people had in mind, obviously, but, I'll wait and see. Thanks. Resources used to build temporary structures? That's not what I was expecting, but it sounds really good! However, that means ANTs aren't "resources 2.0". Can we get nanite supply sorted out somehow then? For example, give warpgates +20, major facilities +10 and large outpost +2 or something. what is the motivator for dropping the cert farm for something like this? I can see that maybe more established players, who have had enough time to unlock the majority of the toys they wanted, would have less restricted ambitions. But more casual and recent players would still need to go through this process. By allowing, as you say, players affect the gameplay (of other players), all I can see is it being disruptive to players that ar amidst this practically mandatory process. Will there be radical changes in the dynamics and what players perceive as a winnable bet? I mean, base capture still isn't the real focus behind logging into PS2. Having your outfit label plastered on a base, almost arbitrarily chosen from a pool of other participants is no motivator. Having a base in the possession of your faction offers nothing either. What will the new resources, harvestable by ANTs, offer so that people start thinking "I should stop trying to murder the guy in front for the simple reason that he is blue and not red like me, and actually ponder about the principles of our conflict". The current labor of putting bodies into the ground pays so well, it makes me curious what will the actual relevance of any new additions be. Seems like a huge pickle. Thanks Luke, looking forward to some new stuff. 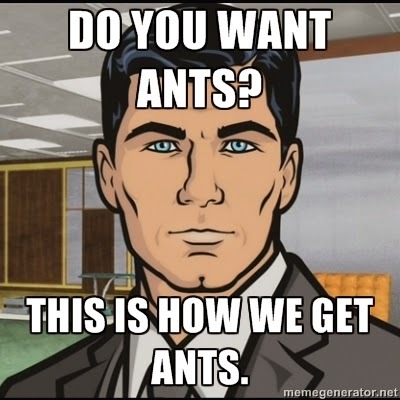 Just hope that ants are used for metagame and not just pointless turret builders, we can but hope though! “Thanks Luke, looking forward to some new stuff. but with tower torret maybe he means "base, little outpost ?"